a thread from the edge: Tag - You're It! I'm giving all the credit to Kit Lang from Diva Quilts for this link - she posted it at her blog today and after being completely mesmerized by the site I knew I had to share it too. The site is called Tag Galaxy- it is such a fun way to wander through the virtual world in photos - you will love it. 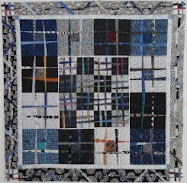 When you get to the site it will ask you for your first tag search - type in "quilt" - when your galaxy appears, click on the center orb for random photos of quilts, or click on one of the rotating planets to explore other aspects of quilting. Following the menu plan for the week - I'm giving a thumbs down to last night's dinner - the Chicken Fried Rice with Leeks and Cranberries - sorry - just not good - too many cranberries and not enough chicken. Tonight's dinner - Roasted Root Vegetable Hash with Parsley Pesto and Poached Eggs was delicious - two thumbs way up!